Summaries of sessions 1,2 and 4 are updated. The old versions are still available at archive. Alien species and Lessepsian migration: a question of semantics? There has been a hot debate about this, with Dov Por claiming that Lessepsian Migrants are not aliens and Bella Galil (and F. Boero) claiming that they are. Por explained his point of view: Lessepsian migrants simply widened their distribution taking advantage of a newly opened passage and arrived to the Mediterranean Sea with their own resources. True aliens arrive at new locations from disconnected geographical areas and it is human action to bring them there, either intentionally (with aquaculture) or unintentionally (with ballast waters, fouling, etc.). This distinction is subtle (Francois Bonhomme called it Jesuitical), it has surely some merit but, as remarked by Bella Galil: man opened the connection, and some of the species became a serious nuisance to ecosystem functioning, like Rhopilema nomadica, a large jellyfish that swarms regularly in the Eastern Mediterranean. Maybe it is not as harmful as Mnemiopsis in the Black Sea, but it has surely a great impact on coastal communities (and economies). CIESM (the International Commission for the Scientific Exploration of the Mediterranean Sea) has launched an Atlas on the Exotic species in the Mediterranean (downloadable at www.ciesm.org/atlas) and included both species that arrived via Suez and Gibraltar and species that arrived with a more direct human intervention. CIESM dedicated two workshops to topics treated in the present forum, one on Gelatinous plankton (www.ciesm.org/publications/Naples01.pdf) and one on ship-introduced alien organisms in the Mediterranean and Black seas (www.ciesm.org/publications/Naples01.pdf). This witnesses the importance that the Mediterranean scientific community is giving to the change that is going on in the basin due to the arrival of species that were not recorded since about 50 years ago. It is the fastest changing large ecosystem of the world, in terms of biodiversity composition, and the liveliness of the debate is based on a tremendous amount of records. Por also recalled the availability of collections that are still to be studied. Lack of taxonomic expertise and of basic approaches in general, is a recurrent lament in these forums on biodiversity and calls for serious measures at European level, as remarked by Emil Olafsson. A W-E diversity gradient in the Mediterranean? Christos Arvanitidis reported on the widely recognised decrease in biodiversity from Gibraltar to the East coast of the Mediterranean. Dov Por added a question about the presence of dwarf populations in the Eastern Mediterranean, reprised by Nina Shurova, and Anastasios Eleftheriou. Recent papers seem to confirm such trends. During the discussion, it has been argued that, maybe, the Eastern Mediterranean has warmer conditions than the rest of the basin and that, after the Messinian crisis and the recolonisation of the newly formed sea from Gibraltar, it did not receive enough species that were tolerant to its climatic conditions on that extreme corner. The opening of Suez might have opened a door for species that were preadapted to these conditions, filling an ecological vacuum. This might give some ground to what Por is arguing: the arrival of species from the Red Sea through the Suez Canal has also positive implications, as remarked also by Lydia Ignatiades. Whatever the judgement on the value of such arrivals, and on the names we give them (aliens, migrants, immigrants, exotics), the change is undoubtedly going on and, maybe, the gradient of decreasing biodiversity from West to East will disappear (?). Bella Galil reported on the deep sea fauna of the Levant basin: "The evidence that the strictly epipelagic thecostomate fauna is not impoverished in terms of species richness underscores the importance of the sills and/or the Quaternary dysoxic and anoxic extinctions in determining the character of the deep bottom-living fauna. The recent findings suggest that the Levantine bathybenthos is composed of self-sustaining populations of opportunistic, eurybathic species that have settled there following the last sapropelic event." Serena Umani, Vesna Flander Putrle and F. Boero discussed about changes in the Adriatic plankton and benthos. In the last 20 years, in that basin, we witnessed jellyfish blooms (by Pelagia noctiluca), red tides (by several species of Dinoflagellates), mucilages (probably by bacteria), the disappearance of commercial bivalves, the introduction of Tapes philippinarum, and thaliacean blooms. This long list of episodic events might be linked by causal ties that, however, cannot be experimentally tested. Each episode might be subjected to observations, measurements and even experiments, but the history over the long term can be only guessed and there is almost no way to test if the reconstruction of a sequence of cause and effect is reasonable. S. Umani set a nice stage, indicating how the Adriatic is an ideal arena to study community change, due to its simplicity (in respect to the rest of the basin) and its circumscribed physical conditions. From one side this is a good reason to use it as a model, but the other side of the coin is that the "model" is more similar to the Baltic than to the rest of the Mediterranean Sea (especially in the very Gulf of Trieste). This is a further demonstration of the richness of microclimates that are available in the Mediterranean, ranging from a situation that is similar to a Northern Sea in the Adriatic to an almost tropical sea in the Eastern basin! The reservoir of Mediterranean biodiversity is spreading along a whole spectrum of environmental conditions. Roberto Danovaro suggested that episodic events, such as the deep sea transient that affected the Eastern basin recently, with a drop in temperature, might be the trigger for a change in nematode (and possibly other) diversity, favouring the entrance of Atlantic species in the Mediterranean Sea. This specific example, coupled with the dramatic change due to the opening of the Suez canal and Lessepsian migration, suggests that biodiversity can respond very quickly to changes in environmental conditions. The ecological explanation of the distribution of organisms (as opposed to the historical one, invoking drivers over geological time scales) has undoubtedly some merits, especially in the sea. Martin Attrill warned about short time series as a way to detect changes in biodiversity even though, as remarked by Danovaro, changes can occur at every time scale. Is there a theoretical framework to interpret biodiversity change? F. Boero proposed chaos theory, not as a way of mathematically modelling a given situation (as implied by George Triantafyllou), but as a way of looking at the world. Chaos theory envisages a deterministic relationship along the time arrow, so that the events of the past determine the events of the future. This is simply history. Is it possible to predict history? Our experience in complex systems (described in an openly sarcastic way by Tim Wyatt) is not constellated by successful predictions! Chaotic systems are indeed deterministic, but they are also extremely sensitive to initial conditions, so that a slight change in some variable can have great repercussions in the structure and function of the system. Function, however, can be some sort of attractor that forces the system to maintain a given structure too. The attractor, once identified and described, can be equalled to a scenario with a great range of indetermination. In other words, we can only perform weak predictions, since we cannot consider all the apparently irrelevant variables that, at a certain moment, might become very important in redirecting the fate of an ecosystem or a community. One of these apparently irrelevant variables might be the presence of a tiny gelatinous alien predator in an almost closed basin. The ctenophore Mnemiopsis arrived at the Black sea by pure chance, and, once there, it developed massive populations that had a strong impact on the functioning of the system. When everything looked on the verge of total impairment, another ctenophore arrived, and it started to feed on Mnemiopsis, strongly reducing its impact. Neither the arrival (and the success) of the first ctenophore nor the role played by the second one would have been predicted by any model. Chaos theory implies that an apparently stable situation might shift to another state in a very short time window. This means that regularities do not tell us much and that the irregularities might be the real drivers of change. This reinforces what Danovaro claimed. A time series that, by pure chance, does not consider a variable that can be important for just a short time (like temperature in the deep sea, where it is considered to be constant) will not tell us much, whereas a lucky measurement of the right variable at the right time might explain a lot! Arvanitidis (and also Boero) recalled the importance of natural history, (taken as the description of organisms and systems - hence taxonomy) and ecology (perceived as the study of interactions among species and their environments). Natural history is the attractor of the system, and it is its knowledge that provides the insight to perform proper modelling, leading to unavoidably weak predictions. Tim Wyatt reported on the life cycle of a dinoflagellate (Alexandrium) in a very original way, showing how a life cycle forces us to disregard concepts such as plankton and benthos, since many organisms shift from one domain to the other. The only way to grasp the mechanisms of biodiversity functioning is to break the nicely packaged concepts that we built for ease of analysis (and modelling and experimentation) and to identify the links among compartments. This will lead to a "vicious" (a word used by Wyatt to label his favourite organism) complexity that will challenge our power of understanding, but this is the way the world is, and we cannot pretend that it is simpler just because otherwise we do not understand it. Marius Skolka and Nikolai Berlinsky provided exhaustive data on the change in biodiversity that is going on in the Black Sea and that is being revealed by the GloBallast programme. The Black Sea is not only going through a Mediterranisation, but is also receiving a tremendous traffic of oil tankers that download their ballast waters there and take oil in. Mnemiopsis and Beroe are only the tip of the iceberg, the amount of change that is going on in biodiversity composition (and presumably in ecosystem functioning) is astonishing. The Mediterranean is the richest sea of Europe in terms of biodiversity. The history in the Mediterranean is very complex, shifting from one ocean (the Pacific) to another (the Atlantic) after a period of deep crisis (the Messinian crisis). Its species composition changed a lot in the past and is rapidly changing even now, due to global phenomena (such as global warming), to local natural phenomena (like the deep sea transient), to indirect human action (the opening of the Suez Canal), and to direct human action, either intentional (the introduction of new species for repopulation and aquaculture) or unintentional (fouling and ballast water species). The Mediterranean has a range of environmental conditions that allow the coexistence of species with much different ecological requirements, being very prone to be invaded: all the events of the past leave, thus, some memory. Coming to recent times, the arrival of some species, like gelatinous predators, shows that a single new species can change dramatically the functioning of a large ecosystem. The impact of new species cannot be predicted: Mnemiopsis is a harmless blob of jelly along the east coast of the United States, whereas it is a disaster in the Black Sea! Some seas, due to their poverty in biodiversity, give the illusion that the biosphere is based on a few important species and that the rest of biodiversity is simply "noise" that can be disregarded with no impairment of our understanding. The Mediterranean is there to falsify the generality of this assumption. Biodiversity matters, and there are no a priori "unimportant" species. This new attitude, based on thorough knowledge of natural history, can only stem at places where these processes are very evident: The Mediterranean Sea, and the connected Black Sea, are a miniature oceanic ensemble that is perfect for the study of complexity, not due to its simplicity (as it paradoxically happens while taking other basins as a paradigm of marine systems) but just to its …. complexity! The high biodiversity and the high rate of change of the Mediterranean Sea, both in structure and in function, provide a unique opportunity to launch vast and coordinated research projects aimed at the understanding of phenomena that, at a slower pace, are affecting the whole biosphere. Knowing the history of a system, identifying the trends of its change and the most sensitive zones to change (and also the periods of intense change) is the basis to perform proper management or, at least, to understand the reasons that led to given situations. Alexandrov, B., Zaitsev, Yu. (2000). Chronicle of exotic species introduction into the Black Sea / Materials of Intern. Sympos. "The Black Sea ecological problems" (31 October-5 November, Odessa, Ukraine).- OCNTI.- P. 14-19. Alexandrov, B.G., Zaitsev, Yu.P. (1998). Black Sea biodiversity in eutrophication conditions // Conservation of the Biological Diversity as a Prerequisite for Sustainable Development in the Black Sea Region. Dordrecht: Kluver Academic Publ.- P. 221-234. Antipa Gr. (1941). Black Sea. Imprimeria Nationala,Bucuresti (in Romanian). Bacescu M., Müller G.J., Gomoiu M.- T. (1971). Marine Ecology, Vol. IV. Ed.Acad., Bucuresti (in Romanian). Bellan-Santini, D. (1990). Mediterranean deep-sea amphipods: composition, structure and affinities of the fauna. Progress in Oceanography, 24: 275-287, figs 1-10. Bethoux, J.P., Gentili, B., Raunet, J. & Tailliez, D. (1990). Warming trend in the Western Mediterranean deep water. Nature 347, 660-662. Boero F. & J. Bouillon. (1993). Zoogeography and life cycle patterns of Mediterranean hydromedusae. Biol. J. Linn. Soc. 48: 239-266. Boero F. (2001). Light after dark: the partnership for enhancing expertise in taxonomy. Trends Ecol. Evol: 16 (5): 266. Boero F., (1994). Fluctuations and variations in coastal marine environments. P.S.Z.N.I: Mar.Ecol. 15: 3-25. Boero F., 1996. Episodic events: their relevance in ecology and evolution. P.S.Z.N.I: Mar.Ecol. 17: 237-250. Bogi, C. and B.S. Galil, B.S. The bathyenthic and pelagic molluscan fauna off the Levantine coast, Eastern Mediterranean. Bollettino Malacologico (in press). Carlton J.T. (1995). Exotic species in the sea: biological invasions and marine biodiversity. IOC.FAO/IPHAB - III/3 Annex XII, UNESCO, Paris. CIESM. (2001). Gelatinous zooplankton outbreaks: theory and practice. CIESM Workshop Series, 14, 112 pp, Monaco. Flander Putrle, V. (2003). Phytoplankton biomarker pigments as an indicator of a trophic state of the coastal sea. Doctoral dissertation. University of Ljubljana, Biotechnical Faculty, Department of Biology. 158 p.
Forbes, E. (1844). Report on the Mollusca and Radiata of the Aegean Sea, and on their distribution, considered as bearing on Geology. Report of the 13th Meeting of the British Association for the advancement of Science. John Murray, London. pp. 130-193. Fredj, G. and L. Laubier. (1985). The deep Mediterranean benthos. In: M. Moraitou-Apostolopoulou, V. Kiortsis, (eds. ), Mediterranean marine ecosystems, Nato Conference Series 1. Ecology, 8: 109-146. Fredj, G. (1974). Stockage et exploitation des données en écologie marine. C: Considerations biogéographiques sur les peuplement benthique de la Méditerranée. Mémoires de L' Institut Océanographique, Monaco, 7: 1-88. Gomoiu M.-T., Skolka, M. (1998). Evaluation of marine and coastal biological diversity at the Romanian littoral - a workbook for the Black Sea ecological diversity, "Ovidius" University Annals of Natural Science, Biology-Ecology series, Vol. 2, Supl., 167 pp. Gomoiu M.-T., (1995). Conservation des écosystèmes côtiers de la mer Noire. Problèmes et perspectives. CIESM Science Series 1: 111-116, Monaco. Huissman J. & F. J. Weissing. (2001). Fundamental unpredictability in multispecies competition. Am. Nat. 157: 488-494. IMO Bulletin. (1998). To put an end to invasion of alien organisms as a result of their transportation with ballast water.October, 1998.- 21 pp. Jackson J. B., S. Lidgard, F. McKinney (Eds). 2001. Evolutionary patterns. Growth, form and tempo in the fossil record. University of Chicago Press, Chicago, 399 pp. Klausewitz, W. (1989). Deepsea and deep water fish of the Eastern Mediterranean, collected during the METEOR Expedition. (1987). Senckenbergiana maritima 20(5/6): 251-263. Komahidze A., Mazmanidi N. (compilers). (1998). Black Sea Biological Diversity, Georgia. Black Sea Environmental Series, Vol. 8, 167 pp, U.N. Publications, New York. Marinov T., Golemansky V.G. (1989). Second supplement to the catalog of the Bulgarian Black sea Fauna, Acta Zoologica Bulgarica, BAS, Sofia, 37: 3-33. Mordukhai-Boltovskoi F. D. (editor), (1968 - 1972). Opredelitel' fauna Chernogo i Azovskogo Morei., Isd. "Naukova Dumka" Kiev, vol. I (1968), vol. II (1969), vol. III (1972) (in Russ.). Pérès J. M. (1985). History of the Mediterranean biota and the colonization of the depths. In Margalef, R (Ed): Key Enviroments Western Mediterranean. Oxford, New York, Pergamon Press: 198-232. Petranu Adriana (compiler). (1997). Black Sea Biological Diversity - Romanian National Report, Black Sea Environmental Series Vol. 4, 314 pp, U.N. Publications, New York. Sarà, M. (1985). Ecological factors and their biogeographic consequences in the Mediterranean ecosystems. In: Moraitou-Apostolopoulou, M., & V. Kiortsis (Eds): Mediterranean Marine Ecosystems. NATO Conference Series, New York, London. Plenum Press: 1-17. Savusin, V.P. (2002). Ballast waters as the source of marine habitat pollution / In: Zakhyst dovkillia vid antropogen. navant.- Kharkiv-Kremenchug: RA "Ekspert" Publ..- Vol. 6 (8).- P. 57-67 (in Ukrainian). Skolka, M., Gomoiu M.-T. (2001). Alien invertebrate species in Romanian waters. "Ovidius" University Annals of Natural Science, Biology-Ecology series, Vol. 5: 51-56. Valkanov A. (1957). Catalogue of our Black Sea Fauna/Trudova na morskata biologichna stantziya v gr. Varna, Arbeiten aus der Biologischen Meeresstation in Varna (Bulgarien), Sofia, 19 : 1-61. Walther, G. R. et al. (2002). Ecological response to recent climate change. Nature 416, 389-395. We have had a interesting interchange of ideas and some discussions that answered to the provocative aspects presented in the introduction. Here, I will intend to put the more important opinions we had during the e-conference, ordered by themes. i) Mediterranean fisheries are characterised by high diversity in terms of catch composition and the structure of the fisheries sector. Traditionally, most of the fishing activities are concentrated along the narrow continental shelf and the commercial catches are composed of even more than 100 species. Generally, due to lack of systematic data collection from the fisheries sector, formal stock assessment studies are lacking or they have a high degree of uncertainty. However, it is generally accepted that most stocks are heavily and even over-exploited by any criterion. Fishing puts pressure in the marine community and as it intensifies, a progressive disappearance of the larger individuals from the catches is happening, with finally a remain of one or two year classes. This "fishing-down" phenomenon is common for several Mediterranean fisheries, mainly bottom trawl and static-net ones, targeting demersal species. Apart from the target species, fishing often reduces the abundance of non-target ones, either through the direct removal of individuals (by-catches or discards) or indirectly by altering food chains. Although it is clear that fishing activities have a serious impact on the biodiversity in the Mediterranean, particularly concerning coastal ecosystems, it is difficult to quantify such an impact, as these ecosystems are also affected by other non-fishing activities. Activities that cause habitat erosion and, consequently, affect biodiversity. Furthermore, the lack of reliable fishery statistics and the limited international co-operation, in terms of scientific surveys in the area, make the extensive assessment of fishing effects on biodiversity even more difficult. ii) Critical comments about this pessimism support the idea that most fishery records, and not just in the Mediterranean, are not collected for scientific purposes, but usually for economical goals. Nevertheless, some records can yield valuable information on the ecology of the target species. Especially those time series that comprise several centuries. Their analysis reveals approx 100 year and 20 year signals which account for more than 50% of the variance and which are sychronous over the whole western Mediterranean. Higher frequency variation is sychronous at smaller spatial scales. There is almost no possibility that the low frequency signals are generated by economic or historical events, and more likely the reverse is true. This kind of analysis provides the evidence we need to describe the natural variability of populations as distinct from that induced by exploitation. iii) On the other hand, invasive species are also important because these species can move among areas and along the Mediterranean. However, not only commercial, but also non commercial species must be considered in this context, because any species can disturb the communities and modify its biodiversity dramatically. In addition, fishing activities can contribute to the drain of organisms, leaving behind an empty space that later will be occupied by others. With respect to other subjects that struggle, I wanted to point out some general considerations: The advances and backward movements of the organisms in the Mediterranean river basin have always existed. To investigate the causes, it is necessary to look for them in the geologic and climatic changes that have occurred from remote times to the present time. Their effects on the organisms, considered like native in a time interval, in fact are repeatingly occuring, long before we were there for documenting them. iv) Under an Ecosystem-based Fisheries Management (EBFM), both concepts of conservation and management achieve a high level of integration. Increasing evidence and awareness of the shifting baseline effect and irreversible ecosystem changes point to deep structural and functional changes affecting ecosystems, even over historical time-scales. The primacy of fishing and overfishing as the main factor for ecosystem change constitutes a key aspect. Fishing and overfishing, though so often being the most critical factor (through reducing ecosystem resistance) for further deterioration, is very often accompanied by other anthropogenic factors. It is clear that even from a conservationist perspective, the adequate goal could hardly be the restoration of the previous, pristine ecosystems, but the maintenance or rebuilding of reasonably healthy exploited ecosystems from a structural and functional point of view, compatible with the maximum conservation of biodiversity. The same goals should also be shared under a fisheries management perspective. Any real attempt to develop a precautionary ecosystem-based fisheries management regime would seek to maximise ecosystem resistance and resilience as well as to optimise the return from the fishery or fisheries being managed. In this regard, it is suspected that resistance in degraded ecosystems is somewhat supported by varying levels of redundancy in the functionality of different species, pointing to the need to maintain and enhance biodiversity and to increase resistance against ecosystem collapses. This latter principle is also valid for maintaining keystone species. Keystone species - crucial to keep the functional and structural integrity of ecosystems - can be extremely difficult to identify, and even more important is the fact that they can get replaced by others with some time as ecosystems are complex and evolving entities. With this premise in mind, it is evident that conserving biodiversity (including functional population levels of the different species) is not only a conservation objective but also a first order objective for fisheries management under an EBFM framework. The resolution of the declared crisis of the Mediterranean fisheries needs to pass through the maintenance of biodiversity and the conservation of resources. The only way to obtain this result is to apply as soon as possible the ecosystem based management principles to fisheries. Notwithstanding the importance of EBMF is highly emphasised by the Reykjavik Declaration, we can observe a strong resistance in adopting this approach by the Mediterranean fisheries policies and research. Although, the ecosystem approach can produce impressive improvements in the understanding of ecosystem processes and conservation of biodiversity, it has, however, to take into account new types of information. Some of the information is available within the established biological fisheries research and regularly used in the management of several important fish stocks. Additional information, including information on changes in the marine ecosystem and an explanation of these changes are, however, important in order to ensure that decisions regarding management measures are consistent with the complex dynamics of the ecosystems in a long term perspective. Improved co-ordination and co-operation between national and international research institutes is imperative in this respect. Monitoring the ocean environment has important short-term implications for controlling the adverse effects of human activities. However, there is also a long-term purpose in registering changes taking place over decades or longer periods. Such long-term monitoring is essential in order to separate human influence from natural cyclical phenomena or distinct trends in the changes of the marine environment, that may run over many decades or even centuries. Without that sort of knowledge, managerial measures may be in vain, or have little positive effect on observed changes. Biodiversity, however, is an important issue not only to protected resources and habitat, but also to achieve sustainable fisheries. While many of the effects of fisheries on the biodiversity are obvious, evidence is lacking for drastic effects that can be produced on the time scale of decades. Those include changes in genetic and ecosystem diversity from levels that have been achieved over million of years through natural selection. Unfortunately, traditional centralized approaches to the management of fisheries are not always capable to control the fishing pressure. New approaches that would include establishment of closed seasons and reserves, and the ban of environment-damaging fishing methods, developed and enforced with the involvement and responsibility of fishing communities are needed. It is important that we look at long time periods because the short data sets we have, makes it very hard to resolve causes of changes in abundance and distribution since they have wide sources of error due to many factors that are co-varying. Longer data sets can aid in resolving this. In addition, many of the factors that affect fish abundance also vary at long time scales and we need long time series to have any hope of detecting them. The resolution of the declared crisis of the Mediterranean fisheries needs to pass through the maintenance of biodiversity and the conservation of resources. The only way to obtain this result is to apply as soon as possible the ecosystem based management principles to fisheries. Notwithstanding the importance of EBMF is highly emphasised by the Reykjavik Declaration, we can observe a strong resistance in adopting this approach by the Mediterranean fisheries policies and research. The ecosystem approach can produce impressive improvements in the understanding of ecosystem processes and conservation of biodiversity, although it has to take into account new types of information. Some of this information is available within the established biological fisheries research and regularly used in the management of several important fish stocks. Additional information, including information on changes in the marine ecosystem and an explanation of these changes are, however, important in order to ensure that decisions regarding management measures are consistent with the complex dynamics of the ecosystems in a long term perspective. Improved co-ordination and co-operation between national and international research institutes is imperative in this respect. Monitoring the ocean environment has important short-term implications for controlling the adverse effects of human activities. However, there is also a long-term purpose in registering changes taking place over decades or longer periods. Such long-term monitoring is essential in order to separate human influence from natural cyclical phenomena or distinct trends in the changes of the marine environment, that may run over many decades or even centuries. Alheit, J. (1997). Climate forcing of European herring and sardine. Fisheries Oceanography, 6: 130-139. Anonimous. (2001). Towards Holistic Fisheries Management: A Mediterranean Perspective. Report of the Workshop Contract no. Q5AM-2000-2. Heraklion. Crete, 22 pp. Caddy, J.F. (1993). Some future perspectives for assessment and management of Mediterranean fisheries. Sci. Mar., 57(2-3): 121-130. Cury, Ph., L. Shannon and Y.-J. Shin. (2001). The functioning of Marine Ecosystems. Sustainable Developments, Octobre, 61(1): 22 pp. Daily, G.C. et al. (1997). Ecosystem Services: Benefits Supplied to Human Societies by Natural Ecosystems. Issues in Ecology 2: 1-16. FAO. (1999). Indicators for sustainable development of Marine Capture Fisheries. Technical Guidelines for Responsible Fisheries, (8): 68 pp. Roma. Farrugio, H., P. Oliver and F. Biagi. (1993). An overview of the history, knowledge, recent and future research trends in Mediterranean fisheries. Sci. Mar., 57: 105-119. Fiorentini, L., J.F. Caddy and J.I. De Leiva. (1997). Long and short-term trends of Mediterranean fishery resources. Studies and Reviews. General Fisheries Council for the Mediterranean, N. 69: 72pp. Garibaldi, L. and J.F. Caddy. (1998). Biogeographic characterization of Mediterranean and Black Seas faunal provinces using GIS procedures. Ocean and Coastal Management, 39: 211-227. Jackson, J.B.C. et al. (2001) Historical Overfishing and the Recent Collapse of Coastal Ecosystems. Science 293: 629-638. Juanes, F. (2001). Mediterranean marine protected areas. Trends in Ecology and Evolution, 16: 169-170. Holm, P. (2002). History of marine animal population (HMAP); a global research program of census of marine life. Oceanologica Acta (in press). Machias A, V. Vassilopoulou, D. Vatsos, P. Bekas, A. Kallianiotis, C. Papaconstantinou and N. Tsimenides. (2001). Bottom trawl discards in the N.E. Mediterranean Sea. Fisheries Research. 53: 181-195. MacKenzie, B. R., Alheit, J., Conley, D. J., Holm, P., Kinze, C. C. (2002). Ecological hypotheses for a historical reconstruction of upper trophic level biomass in the Baltic Sea. Canadian Journal of Fisheries and Aquatic Sciences 59: 173-190. Papaconstantinou, C. and H. Farrugio. (2000). Fisheries in the Mediterranean. Medit. Mar. Sci. 1(1): 5-18. Pimentel, D. et al., (eds.). Ecological integrity: Integrating Environment, Conservation and Health. Island Press, Washington, DC. : 227-239. Pitcher, T.J. (2001) Fisheries managed to rebuild ecosystems: reconstructing the past to salvage the future. Ecological Applications 11: 601-617. Tudela, S. and Short, K. (2002). Towards a precautionary ecosystem-based fisheries management: managing ecosystems under a new paradigm. Contribution paper to the Expert Consultation on Ecosystem-based Fisheries Management. FAO Expert Consultation, September 2002, Reykjavik. John Gray raised the point that the idea that one can identify "hot-spots" of high species richness and thereby better conserve diversity came from Myers et al. (2000 biodiversity and hotspots for conservation priorities (Nature 403:853-858) and concentrated exclusively on terrestrial systems. In this paper Myers identified 25 hot spots based on two main criteria species endemism and the degree of threat. The data were on vascular plants, birds, mammals, amphibians and reptiles; the major visible taxa much loved by conservationist NGOs as a focus for advertising their agenda. The 25 terrestrial hot-spots cover mainly tropical areas such as the Indonesia-Philippines archipelago, Brazil, West Africa and Mesoamerica, but also Madagascar, parts of the Mediterranean, New Zealand Southwest Australia and the Cape Province of S. Africa amongst others. The main arguments used by Myers et al. is that 44% of all species of vascular plants and 35% of the vertebrate groups are confined to these 25 hot-spot areas. Thus conservation priorities should be based in these areas. In a follow up paper Cincotta et al. (2000) examined the relationship between human populations and the biodiversity hot spots and showed convincingly that these hot spot areas were under threat from human-caused disturbances. Is the hot-spot idea a useful one to set priorities for marine biodiversity conservation? Ferruccio Maltagliati (Dept. of Human and Enviromental Sciences, University of Pisa, Italy) suggested that it was very difficult to exactly define a "marine hot-spot". Thus, a great amount of work should be still done in the marine environment in terms of basic biological, ecological and evolutionary studies. He argued that on one hand, we can obtain estimates of species richness in coastal habitats and those are often related to a number of ecological processes. On the other hand, it should be noted that more and more species, or species complexes, or sibling species are being discovered across most of the invertebrate taxa (e.g. see Hutchings & Ponder, Mar Pollut. Bull 46:153-154, 2003). So, are the estimates of species richness reliable? John Richard Dolan (Oceanographic Observatory, Villefranche, France) agreed that the idea of 'hot spots' may be questionable with regard to very widely dispersed taxa. For example, Finlay and Fenchel suggest that the species-richness of free-living marine protists is the same everywhere. Clearly diversity in terms of species evenness is not. John Gray added that recent data seems to suggest that marine bacteria and Archea are possibly also cosmopolitan so that there may not be as many species of these taxa as earlier thought. Tim Wyatt (Inst. Of Marine Science, Vigo, Spain) noted that Jim Carlton makes the point that the smaller a species is, the more likely it is that it will be considered cosmopolitan. Tim was recently informed that the morphospecies we call Skeletonema costatum may in fact hide several different species with different bloom periods. And the problem might not be confined to small species. Monteiro & Furness (1998) have shown there are cryptic species of storm petrels in the Azores. which occupy the breeding sites at different seasons. Finally, John Gray pointed out that Nancy Knowlton had reviewed sibling species in the marine environment some years ago and with the wider application of molecular techniques we are likely to find that many "species" are in fact complexes. He asked what does this mean in practical terms for biodiversity conservation? Should we be exploring more about cryptic species or trying to spend more effort conserving habitats in areas where they are under threat? John argued that it doesn't matter if we do not know whether there are 500,000 or 10 million new species to be found in the deep sea. They are not under threat but coastal species are so concentrate our conservation and research efforts in coastal zones. Do we know enough about marine species richness to start to make an attempt to identify marine hot-spots John Gray made the point that in considering species richness we often neglect the historical (evolutionary) aspects. The Black Sea (and Baltic Sea) are recent and most estuaries in northern Europe were covered by glaciers in the last ice-age so that recolonisation from the species pool outside these areas is slow and still occurring. Ferruccio Maltagliati pointed out that even during the last glaciation the Mediterranean was connected with the Atlantic, given that the sill across the Strait of Gibraltar was estimated to be around 280m depth (Bryden & Kinder, Deep Sea Res, 38:445+, 1991). Therefore, the occurrence of a Pleistocenic diversity pump at Mediterranean level must be excluded. Estuaries in the Mediterranean have followed the recurrent hydrogeological dynamics of the coasts driven by the alternance "ice ages/interglacials". A different and, at my knowledge, unknown situation is that dealing with coastal ponds and lagoons which aren subject to more drastic hydrogeological dynamics. In a final comment Dov Por (Israel) commented with the Mediterranean fauna there would be a cycle from interglacial Senegalian Strombus bubonius faunas, through present-day type faunas, to Boreal Arctica islandica faunas and back again. These pulses (see also F.D.Por, Systematic Zoology 24:72-78, 1975) would have the short durations of the glacial fluctuations and therefore not produce species-level speciation. However, elements of the super-warm interglacial fauna continuously survive in the Eastern Mediterranean (and perhaps the Pelagian Sea! ), whereas some boreal elements survive in the north of the Balearic Sea and the Adriatic. In these "refugial areas" an infra-specific segregation from the parent populations might be already underway. Is there a negative relationship between species richness and productivity as on land where low productivity regions (e.g. Southwest Australia and Cape Province) have high species richness? Although no-one addressed this issue specifically Bill Silvert (Inst. of Marine and Fisheries Science, Lisbon, Portugal) pointed out that the presence of "hot spots" often reflects environmental conditions that serve as biodiversity factories, but it isn't clear that the number of species has any fundamental meaning. An archipelago with thousands of islands will quickly generate thousands of separate species, but if one of these species becomes extinct it will rapidly be replaced and the invading species is likely to evolve quickly in the same direction. Speciation often is the result of slow spatial diffusion in a heterogeneous environment, which is why there are so many more species of snails in the tropics than of bears in the arctic. He suggested that we need first of all to consider the possibility that not all species have equal weight - to me the loss of a rare primate like the orangutan is probably a far greater matter than the loss of an equally rare beetle - and perhaps the best way to approach biodiversity is by asking about the marginal value of each species, how some measure of ecosystem quality would be changed if the species went extinct (and the marginal value of some species, like the Anopheles mosquito, may well be negative). What does it (the species of interest) do? How important is this role? Can some other species do the same thing? Does it have intrinsic value to man? Finally Bill raised the issue of making proper risk assessments for the loss of marine species, a view that was supported by John Gray who felt that risk assessment was a severely neglected aspect of marine biodiversity studies. Do we agree that if we conserve the habitat we conserve the species therein so habitat conservation should be a priority in the marine environment? Miquel Alcaraz (Inst. of Marine Sciences, Barcelona) agreed that conservation of habitats was the way to conserve species and pointed out that in terrestrial systems fragmentation of habitats was the main cause of species loss. This view was echoed by Ferruccio Maltagliati, who added that conservation of biodiversity must also take account of the ecological and evolutionary processes that have generated it. So that habitat conservation alone was not enough. In other words, some species have requirements that cannot be satisfied by the conservation of only one or a few habitats or biotopes. But, Martin Attrill (University of Plymouth, UK) questioned that the same phenomenon was as important in marine habitats. He argued that in an open system with most species dispersing as young in the plankton, islands of habitat are still completely interconnected and so it could be argued that fragmentation in the marine environment does not create 'islands' in the sense that we know them on land. Whilst conceding that fragmentation of, for example, sea-grass beds will reduce available area and increase edge effects, he questioned that it would really isolate species or populations from others in similar sea-grass islands and cautioned against extrapolating conservation methods and priorities from the land into the sea. However, Alcaraz and Gray counter-argued that there was strong recent evidence that even species that appeared to be adapted for widespread dispersal did not in fact do so. Data on barnacle and fish larvae showed much more limited dispersion patterns than one might predict. Raising a new topic Dov Por argued that we should first of all deal with the "Blank spots", areas that are insufficiently known such as The Pelagian Sea, or the Syrte Sea in south-central Mediterranean. In reply Martin Attrill suggested that the danger is the gaps will never be truly filled in, or by the time they are it is too late to protect vulnerable known systems. Can we ever know much about the deep ocean, including areas of the Mediterranean? He concluded that due to the way pressures on marine systems are increasing procrastination is not an option! There was also an interesting side-debate on the ecological impacts of aquaculture, but this had little relevance to the main topic biodiversity of the Mediterranean and Black Seas! Why studying gaps in Mediterranean biodiversity? The Mediterranean Basin is the largest of the world's five Mediterranean-climate regions, stretching east to west from Portugal to Jordan and north to south from northern Italy to the Canary Islands. Surrounding the Mediterranean Sea, the hotspot's 2,362,000 square kilometres, including countries (e.g., Italy, Spain, France, Greece, Israel), is rich of scientific history on the relationships between humans and the sea. The Mediterranean Sea is a potential example for an excellent study system. There are several attributes of the Mediterranean Sea, not the least of which is its attraction to all mankind, that make it the perfect site for conducting both large scale and small scale research projects in the field of biodiversity. In this regard Rachel Noble pointed out that the Mediterranean Sea should be considered as an optimal model study site for marine biodiversity due to its concentration of the overall characteristics (human population, non point source inputs, response to climate-related warming and trends, and importance to a wealth of societies). The Mediterranean is the "cultural basin" where the first experts of biodiversity were born (e.g., the Zoological station of Naples, Banyuls-sur-mer, Villefranche sur mer, the Museum-laboratory-of the Aquarium of Monaco, Barcelona). For such historical reasons and for the scientific effort provided into the study of the marine species, the Mediterranean could be the best-studied basin of the world. It is therefore not surprising the large number of species encountered (leading to a high species richness for the Mediterranean region) and the high percentage of endemism. Because of its long history and strong anthropogenic impacts, the Mediterranean often anticipated environmental problems (e.g., eutrophication, mucilage, impact of fish farming known since Romans' Empire), which appeared in other world' seas decades if not centuries later. For example, the Mediterranean is well known for the presence of strong nutrient gradients. Such gradient of trophic conditions is optimal for testing the hypothesis of a trophodynamic control of biodiversity. The Mediterranean Sea is also a good example system for addressing a variety of issues, including the role of temperature in controlling biodiversity and life strategies of marine organisms (as the Mediterranean is a warm sea at temperate latitudes, where deep-sea temperature is always above 12.8°C). The much faster response of the Mediterranean to climate change, make this system as a model for investigating biodiversity response to direct and indirect effects of temperature changes. 1. Overall gaps of knowledge on Mediterranean biodiversity. We still do not have sufficient information for defining the "big picture" of the problems and implications of biodiversity conservation in the Mediterranean. This makes evident that our knowledge of Mediterranean marine biodiversity has a very "limited value", because we are not able to translate our scientific information into precise indications and guidelines to support adequate political decisions. Is this because we did not investigate marine biodiversity in the right way? Simonetta Fraschetti suggested that such "limited value" of our knowledge of Mediterranean biodiversity can be interpreted in two ways. The first aspect is certainly linked to a problem of translation from science to opinion and policy makers (more than 60 Marine Protected Areas have been established in the Mediterranean without any detailed knowledge of the distribution of population, assemblages and habitats to be protected). Secondly there is a matter of approach: the effectiveness of existing MPAs has been often evaluated without the use of sound experimental designs with the consequence that for most of them we still do not know if they work or not. Simonetta Fraschetti also pointed out that the North Sea has been studied as extensively as the Mediterranean Sea (and maybe since longer adopting quantitative methods and sound experimental designs) but is far from having the same richness of the Mediterranean area. However, John Gray suggested to take account of the age of the Mediterranean and North Sea in an evolutionary context. The North Sea was land just 10,000 years ago and is shallow with fairly uniform sediment types. So it is not surprising that it has low richness. On the Norwegian continental shelf we have 2,500 species in soft sediments and probably 5,000 in total. There is no reduction in number of species to the Barents Sea, which is species rich. The Mediterranean should be more species rich due to it having been relatively undisturbed by ice ages. It would be nice to have comparative studies to compare richness and molecular clocks of key organisms. Ferruccio Maltagliati suggested that aspects of the evolutionary/historical context invoked by J. Gray can be found in the Northern Adriatic Sea, whose age is comparable to that of the North Sea. Northern Adriatic, in fact, was emerged during last ice age due to the sea-level low stands (about -120m). Thus, the present day marine communities of that area originated from re-colonisation from the south. It would be interesting, as suggested by JS Gray, to compare richness and molecular clocks of key organisms from the Mediterranean and North Sea, also including North Mediterranean samples. The Mediterranean sea suffers of a major lack of information especially on global deep-sea biodiversity. There are just few studies that reflect specific programmes and cover only few taxa on small spatial scales. This also reflects the lack of adequate financial support for deep-sea investigations. Nelly Sergeeva summarised the knowledge on biodiversity in the bottom sediments bathyal and bathypelagial of the Black Sea. From the moment of founding the hydrogen sulphide zone in the Black Sea and up to the present time they considered, that its depths are lifeless: there is no life in the hydrogen sulphide region except microbial. During entire century lifelessness of deep hydrogen sulphide zone in Black sea is being accepted by the world science as an axiom. This played a decisive role in the planning of hydrobiological studies in the Black Sea only to the depths. Inasmuch as bathyal bottom sediments as benthic life biotopes were neglected by hydrobiologists, three zones were recognised in the Black Sea depending on the occurrence of different dimensional and ecological groupings of zoobenthos. The first, from tide mark to 120-150-m depth, is inhabited by macro- (> 1-2 mm), meio- (1-0,1 mm) and microbenthic (< 0,1 mm) organisms. The second, from the 120-150-m to 250-300-m depth, is occupied by meio- and microbenthos. The third, from the 250-300-m depth to the greatest depth, is where only bacteria dwell. Investigations of the deepwater bottom sediments (40 stations) of the Black Sea at a range of 470-2250 m depths revealed that benthos of the anaerobic zone was partially represented by usual Black sea species, characteristic for the shelf zone, and by hydrobionts, earlier unknown for the Black Sea and for science. About 40 species of benthic organisms from Ciliata, Nematoda, Foraminifera, Kinorhyncha, Harpacticoida, Amphipoda, Acarina and 20 unknown forms of conditional up to the present time taxonomic belonging have been found. These organisms have so peculiar structure that it impedes their attribution to known types and classes of invertebrates, therefore, they have been only tentatively identified. The occurrence of the same taxa over the wide depth range and in different locations of the sea indicates to the factual existence of life-forms with the status higher than microbial. Therefore, it is logical to presume that "marine snow" sunken to the deep-sea anoxic zone is utilized not only by microflora but also by benthic organisms of different trophic groupings. The deep-water benthic fauna is highly diverse and specialised. The hydrobionts inhabiting sea bottom of the Black Sea bathyal were subdivided according to the origin into 1) species common on the shelf which are brought down into the depth one way or another, and 2) endemics of deep-sea anoxic zone which markedly differ from fauna of surface and subsurface waters of the Black Sea. In conclusion, it should be stressed that the term "azoic" is not valid when applied to anoxic zone of the Black Sea: the life is diverse and plentiful there. Investigations must be conducted on to fill the gaps in the current knowledge about principles underlying functioning of the deep-sea anoxic ecosystem. Studying the composition of fauna confined to the anaerobic abyssal, its morphological and physiological features, vertical and spatial distribution would answer many questions about the origin and formation of the endemic fauna, the role it has been performing in organic matter transformation and cycling in ecosystem of the Black Sea. We need to better investigate fauna common on the shelf and able to survive in the hydrogen sulphide-contaminated environment; about the ways by which these organisms penetrate the deep sea, the related adaptations and energy sources sustaining their life. The revision of marine life occurrence in the Black Sea will stir up interest of many marine biologists and geologists. Today, our study may be regarded as search, and the obtained results as tentative, both asking for further development. 2. Lack of information on biodiversity distribution at different scales. The field of biodiversity is multi-scalar, there is an evident need for future advancement on approaches covering a wider perspective (from global - ecosystem - community - population down to genotype biodiversity), but also we need more information on variability of biodiversity at different spatial scales (from local to meso-, regional and macro scale). Simonetta Fraschetti, in this regard, rightly observed that the difficulty in comparing the biodiversity of different areas recall the urgent need for using proper monitoring protocols and the develop of efficient and rapid sampling techniques. This would represent the basis for a wide-scale monitoring network of Mediterranean coastal system. The prospect of carrying out large-scale studies to tell apart the sources of natural variability (if still exist) from those induced by human activities is still the requirement to understand effects of pollutants and efficacy of protection. The generalisation of unreplicated small-scale studies is basically unreliable. John Gray and Simonetta Frashetti raised the point of sampling scale for biodiversity analysis. Most studies have no idea what the patterns are at larger scales, i.e., at the regional and biogeographical province levels. Recent research suggests that local species pools are largely determined from regional pools. This holds for coral species but we do not know much for other groups. In the terrestrial literature it is argued that since there is a linear relationship between local and regional richness then local richness is not greatly influenced by proximal factors such as predation and competition. Yet there are few marine studies that have been done on this topic. It is a large gap in our knowledge, but it needs large comparative data sets and the Mediterranean would be a hugely interesting area in which to tackle this topic. 3. Limited knowledge on the role of physical processes in the development and maintenance of biodiversity. Rachel Noble pointed out the role played by physical mixing and watermass movement characteristics providing a potential link between studies of "open ocean biodiversity" and other aquatic systems like lakes, streams, and rivers, but also stressed that our understanding of the role that physical processes play in the development and maintenance of biodiversity across aquatic systems is nominal, at best. Alessandro Bergamasco suggested that a possible approach to overcome this difficulty is the study of (small) regions where the two classes of processes interact at comparable scales. A particularly important role could be assigned to the Straits of Messina, where several oceanographic processes are detectable, e.g. strong tidal currents and turbulence, upwelling, thermal fronts, internal waves. Furthermore, the system exhibits strong and very steep gradients of physical features and biodiversity, including deep-sea as well as sheltered areas (coastal ponds). Several questions remain unanswered: Can abiotic features of the environment play a control on the processes which influence spatial and temporal patterns of biodiversity? Can global-scale climatic changes determine indirect local changes to biodiversity? Could the above happen through the modulation of the role of a "deep-coastal system" as a generator, carrier and amplifier of biodiversity? To support the discussion on these items Salvatore Giacobbe and Franco Decembrini proposed the example of benthic alien animals and plants, which through the Straits of Messina began their spreading in the two sub-basins (Tyrrhenian Sea and Ionian Sea; e.g., the crustacean decapod Percnon gibbesi coming from the Atlantic Ocean, and the lessepsian migrant seagrass Halophila stipulacea), but other examples and case studies are needed. 4. Lack of information on long-term biodiversity trends. Rachel Noble stated that, in order to begin to properly assess biodiversity in the Mediterranean, there must be a concerted, cross-nation effort to establish baseline information for assessing historical trends in biodiversity. Of course, this is not possible for many taxa, but it may be possible to utilize several "sentinel" species over the past 1,000s of years, to begin to understand this concept of species loss, and how natural stressors and anthropogenic stressors affect loss. Nickolai Shadrin pointed out that climate is a main driver of biota changes. But detecting climate impact over marine biota means gathering long-term data set. There are studies on periodical changes in the Black Sea plankton and benthos (in Russian). But this aspect of biota changes is very poor studied in both the Mediterraenan and the Black Sea. Therefore, we cannot quantitatively assess the role of variability of different climatic parameters (temperature, precipitation regimes, wind regimes, etc.). We only try to start to do it. A possibility would be using the archaeology: e.g., for studying mollusc shells compositions in antique and middle age village litter. Investigation of climatic variability impact on biota on different spatial and temporal scales is possible only with strong international coordination. 5. Predict the impact of pollutants on biodiversity and species loss. The effects of anthropogenic impacts (eutrophication, environmental stressors and micro pollutants) on both structural and functional aspects of biodiversity are of special interest for the Mediterranean Sea with its high degree of human activities and ever increasing coastal development. For a better understanding of the quantitative importance of pollution on biodiversity there is strong need for methods able to specifically detect structural and functional biodiversity parameters. The development of accurate methods for measuring biodiversity with time may allow us to also estimate the magnitude of species richness, and possibly monitoring the species list. In this regard Simone Mirto suggested that changes in biodiversity, can be very useful for environment impact assessment, but we need overall rapid diagnostic tools, allowing a "real time" environmental monitoring, which is requested for an appropriate and effective management. Macrofauna is commonly utilised for E.I.A. for assessing anthropogenic impacts. However, the use of macrofauna, due to long life span of most species and to the larval supply from other areas, can be not suitable for studies aiming at identifying early indicators of ecosystem change. Probably, microbial-molecular parameters and short life-span species are more suitable to detect different typologies of impacts on the environment. There is a need for identifying generals biodiversity descriptors of overall biodiversity. Moreover, another major scientific task is investigating the resilience of an ecosystem in terms of structural and functional biodiversity. There seems to be a strong sense that we need to find something to measure, anything, so that we can talk about biodiversity in numerical terms. The problem is that quantities we can measure are often only poor proxies for the things that really matter. William Silvert proposed to investigate trophic breadth as it is possible that the loss of some top predators might actually increase the total number of species in a system, but surely that is not what we would consider an improvement in the biodiversity index (unless the vanishing top predator were man). It is possible that finding something that we can measure accurately will not help us with biodiversity issues. We should work in conjunction with all interested parties and find indices that reflect both ecological and social values. And we should test these indices against sample scenarios to see whether they agree with common sense. Simone Mirto also proposed the use of biodiversity in an applied framework, but only after we are able to select adequate tools (i.e., taxa), and monitoring changes in biodiversity for these "elected". William Silvert, however, did not agree that all species are equally important, neither that selecting a single indicator taxon to measure biodiversity is a good strategy. The debate on the importance of different species involved Ferruccio Maltagliati, William Silvert and Simone Mirto. A possible solution proposed by William Silvert is: we cannot realistically hope to conserve all species, we have to gamble, and inevitably we will make some mistakes. The argument that we so often hear from scientists, that since we don't know everything we can't do anything, just doesn't work. We can't protect biodiversity without public support, and that means following a strategy that is politically acceptable. In other to achieve the conservation objectives, Paolo Magni proposed to increase the value of existing data by combining them into a common data set to determine large-scale relationships. In this context, the UNESCO/IOC Ad hoc Study Group on Benthic Indicators has merged data sets containing synoptic information on environmental variables and benthic macrofaunal communities from several coastal regions around the world. As such, it is critical identifying variables that could serve as indicators, or "warning signals," of related adverse environmental conditions leading to stress in the benthos and strong changes in biodiversity. Important attributes of such an indicator are: 1) reliability in their ability to detect stress or change in biodiversity and 2) ease of use and broad applicability in different parts of the world. In the Mediterranean Sea, relevant initiatives have been recently started within the first MedGOOS (Mediterranean Global Ocean Observing System) project MAMA "The Mediterranean network to Assess and upgrade Monitoring and forecasting Activity in the region." In particular there is a clear need of scientific assessment of existing ocean observing (and monitoring) systems in the Mediterranean at regional, coastal and national scales to design scientifically proven and cost effective coastal data acquisition systems, fully integrated to the basis scale systems. Nikolai Shadrin illustrated the case of the Black Sea, which is experiencing drastic changes. There are about 60 alien species, which are spreading in the Black Sea now. Results from invasions of few of them are well known: Mnemiopsis, Rapana, Balanus, etc., but for most part of invasions results are not evaluated yet. We are far from integrated value of total alien species role in the Black Sea biota changes. Now we can make several conclusions: invasion is never neutral. Even if an incomer does not replace a native species but occupies the niche, which is or has became vacant owing to some other factors, it may excludes the possibility for the native species to colonise this niche. Additionally newcomer can create new niches in some biotopes or water bodies. The impact of alien species is complex and unpredictable in principle. The Black Sea is not only recipient of aliens but it plays important role as a donor and transit water body for alien species. Initially in the Caspian Sea (more than 30 species) and then in the Marmara and Mediterranean Sea. Nelly Sergeeva concluded illustrating other aspects of the impact of anthropogenic pollution on the Black Sea, which is steadily increasing. The negative effect is revealed in extinction of species, community perturbations, serious physiological changes arising in organisms, resulting in different pathological phenomena. In the course of the long-term investigation of the Black Sea meiobenthos nematodes subjected to revealed distinct morphological deviations. In some nematodes amphids were anomalous in number, arrangement and localization. The occurrence of anomalous specimens in certain nematodes species, from natural gas seep areas in the western part of the Black Sea, is also of special interest and poses several questions, among which: What is the specific cause of these anomalies? Is that related with highly polluted habitats? Have these anomalies been identified from other polluted or extreme habitats? How spread is the phenomenon that's been noted in the Black Sea? 6. Insufficient coupling of classical and molecular techniques for studying biodiversity. There is a limited confidence of "classical" taxonomists in the opportunities offered by molecular biology. For instance, the number of species defined on the basis of the morphological features certainly does not give an appropriate idea of the actual species number, considering the discovery of an increasing number of cryptic species. Laura Giuliano pointed out that microbial-molecular parameters could represent suitable overall rapid diagnostic tools allowing a "real time" environmental monitoring due to the fast answering of microorganisms to the changes of environmental conditions. This appears particularly relevant in aquatic environments, where microorganisms play a crucial role in the trophic webs so that alterations in the microbial functional structures might provoke cascade effects. Changes in bacterial diversity occur in hour-time scale, so that the screening of the bacterial community structure dynamics in a relatively short time scale (from hours to months) can provide indications of the biological response to any environmental forcing. But are they significant at "ecosystem" level? And are we able to measure them in a reliable way? We need to better establish the functional role of the different bacterial taxa. The fast progressing molecular based methodologies could provide very helpful tools for improving in this field but a strong attention must be given to their related biases so that a big effort to develop quite "objective" protocols should be done. For instance, available literature on bacterial taxonomic diversity is based on the bacterial gene 16S rDNA, but the real descriptors of any changes in a reliable time scale are the expression products of these genes (16S rRNA). To do this we need optimised techniques for handling with RNA samples. Another methodological problem is related to sample volume. Some specific environments like the deep-sea anoxic basins, due to their relative low diversity, may represent a very suitable "natural laboratory" for coupling the bacterial taxonomic diversity with the functional diversity. More complex environments, such other coastal or pelagic marine areas, could contain several redundant bacterial taxa. Among the very promising approaches for a global overview of the bacterial functional diversity characterising the different ecosystems, a special emphasis must be given to the "Multi locus transcription sequence (MLTS)" technique, that provides bulk of experimental data on nucleotide sequences of complete bacterial genomes, included quantitative values of regulatory genomic sequences, from which information on the bacterial metabolic pathways could be derived. Antonio Dell'Anno opened another window on microbial species richness, which is estimated to range from 105 to 106, but yet almost completely unknown. Molecular tools have provided new insights on prokaryotic diversity, revealing a surprisingly high number of new taxonomic prokaryotic groups in all marine environments investigated so far. Noteworthy the case of the deep anoxic basins of the Mediterranean investigated in the frame of the EU projects (such as the BIODEEP). The limited information available on microbial diversity, particularly in deep-water masses and marine sediments is a major gap in our knowledge of Mediterranean biodiversity. However, possible biases of the actual microbial diversity induced by the presence of 16S rRNA gene associated to extracellular DNA have been never addressed. This appears of paramount importance since marine sediments among all aquatic systems investigated so far contain high amounts of extracellular DNA exceeding up to ten times DNA content associated to living cells. Therefore, extracellular DNA may potentially represent a reservoir of genes contributing to misleading the actual diversity of prokaryotes. This could be another gap in the investigation of prokaryote diversity. 7. Lack of studies addressing the coupling of biodiversity with ecosystems functioning, productivity and economical profitability. Investigating marine biodiversity does not mean making a simple species list (although essential as first step). Wulf Greve suggested that functional biodiversity could be the key to successful prognoses and we need to focus our research on a fast development of operative prognostic tools. Roberto Danovaro pointed out that we need to better understand the way biodiversity contributed to the preservation of the natural capital and related economical value. Rachel Noble suggested the linkage between biodiversity, ecosystem function, and economic profitability could not be stressed highly enough. If we do not create tools for assessing biodiversity as a scientific community, and create them in a language and manner useful to managers and public policy makers, then we will have two alternatives. One, the managers will make the tools themselves, to please themselves. Two, the issue will be largely ignored because the impression will be that biodiversity does not matter. Given our choices, we, as a community have to make an effort to demonstrate the "real world" intrinsic value of biodiversity, and the cross-discipline importance of work to preserve biodiversity across all systems. In a sense, as aquatic scientists, we have an even more difficult job to do, because the undersea world is not visible, giving us the added hurdle of 'out of sight, out of mind'. In studies of biodiversity, we are responsible for creating the imagery necessary to interest and engage the policy makers in the "real world". In response to this John Gray raised the question: does species richness matter? The reason for such question started from studies on the Norwegian continental shelf were the John's lab found that of 809 species over 200 occurred at one single site and 180 others at just two sites (of 101 studied). If this were a general rule, most species would just hanging in and would not provide "goods and services" for mankind. Sure they contain genetic diversity but the only "product" come out of deep-sea diversity that I know is Craig Smith's bacteria that degrade sterols and fats at below 4°C and are likely to appear in detergents of the future. So, claimed John Gray, there is huge species redundancy that makes most species functionally unimportant. This position provoked several reactions and different positions and perspectives. Ferdinando Boero made the point of the value of biodiversity which is not important just because it is of some use for us (e.g., providing goods and services). Ferdinando Boero also posed strong arguments for defending apparently unimportant species as they are the core of biodiversity. Functionally important species are often a ridiculous minority, but an unimportant species now might be very important tomorrow. Mammalians were irrelevant when the dinosaurs ruled the planet, but were expendable. Function cannot be studied in an ahistorical framework, and evolution is the other medal of ecology. Unfortunately experiments cannot take evolution into account, and also history. The message by Ferdinando Boero is clear: take into the highest consideration also species that, apparently, have no major functional role because in the future they could rule the world. John Gray reported that functional roles of marine species is an increasingly investigated issue that could open interesting research fields for young scientists, indeed Roberto Danovaro stressed that species redundancy can be just apparent. We need more tools for understanding exactly which is the functional role of each species. It is increasingly evident that higher biodiversity increased (in a non linear relationship) ecosystem functioning and efficiency. This give a warn about the importance of apparently "redundant" species. Until we do not know enough about the functional role of most species and even less about the functional relevance of their interactions we should apply a precautionary principle to all species, independently from our present anthropocentric view. John Richard Dolan recognized that the experimental evidence demonstrating links between diversity and function is quite weak - and for the marine environment simply non-existent. We can hide behind Petri dish experiments or elegant mathematics but at our risk and peril. We need to be open to the possibility that we are examining the wrong scales of time or space - no matter what kinds of experiments we concoct. At the same time we know more about functional aspects of prokaryotic diversity than not on metazoans. This is a great temptation for trying to solve major ecological questions (such as the one dealing with the relationship between structural and functional biodiversity) using bacteria. Understanding ecosystem functioning at the bacterial level is extremely important, but as, Ferdinando Boero says, from one side there are people who say that biodiversity is important only if it is useful to us, from another side there are people who say that we are irrelevant and that bacteria make the world turn. We need a compromise. But there are priorities. According to Ferdinando Boero the final extinction of a species is hard to document and we cannot find a single example of final extinction. Maybe there is something going on for a limpet at Malta. The rest is just a short list of threatened species (the usual monk seal, turtles, Pinna nobilis, red coral, dolphins). The real threat to biodiversity is that, possibly, lots of inconspicuous species became extinct and we do not even know that they ever existed. Extinction, for species, is like death for individuals. And speciation is their reproduction, leading to perpetuation. But if the habitats disappear, some body plans might disappear. I agree that we can give not much care to one or two species of nematodes that are possibly in danger, but if they die because their habitat is disappearing, then they are the sentinels of something that might worry us. Ferdinando Boero thinks that we have to make the list of all the species and the inventory of habitat types and to map them, doing habitat geography. Monitoring the boundaries and seeing what is shrinking and what is widening would be another approach to biodiversity, complementary to the taxonomic one. This position was sustained by Gaby Gorsky, who proposed to think about a Mediterranean census of marine life (see www.coml.org) in EU or Mediterranean framework with a minimum of constraints and a maximum of information exchange. William Silvert pointed out the difficulty in defining species importance, as we have to make decisions about marine management, the best decisions, but we cannot hope to protect all habitat. If we could save every species it would certainly conserve biodiversity, but the whole reason we are discussing this topic is that we can't do so. The point of making a list of functionally important species is a matter uncertainty and risk, as declared by William Silvert. For this we need to use common sense as well as looking for experiments which can give precise answers to unanswerable questions. There are several possible criteria for evaluating the "value" of a species, including social as well as ecological factors. There are of course others - perhaps a species may prove a source of a valuable pharmaceutical product. But a rigorous scientific analysis can be insufficient to produce adequate answers to issues of conservation of biodiversity. We have to take into account other factors, some of them subjective, to arrive at realistic solutions to the problems of possible species loss. Carlos M. Duarte opened the topic with an introduction discussing the major changes in marine biodiversity in the Mediterranean following large changes in sea level over geological time scales, as well as chatastrophic perturbations - as pointed out by Tim Wyatt - to then identify human pressure as a new, growing driver of biodiversity change in the Mediterranean and Black Seas in the past two millenia. John Gray elaborated on the importance of the deep-sea as a posible repository for fauna to recolonise folowing major climatic changes, along with inmigrants from adjacent seas, although perturbations, due to changes in the oxygen level of deep waters, have also impacted deep marine biodiversity in geological times (Dr. Por). Miquel Alcaraz argued that because of the small size of the Mediterranean and Black Sea basins relative to other seas, these amplify the impacts of climate change, marine biodiversity may show an earlier response in the Mediterranean and Black Sea than elsewhere. Ian David drew on these discussion to indicate that, provided climatic changes may lead to changes in baselines of marine biodiversity over time scales as short as a few decades, there is a need to identify and integrate these change in management and conservation frameworks. Prominent among the drivers of change, participants identified human growth in the Mediterranean basin as the major driver of biodiversity loss (e.g. Drs. Ignatiades,Gili, Duarte, Boero). The important role of humans as drivers of change must be conveied, within the existing uncertainties, to society, and Dr. Sardá urged scientists to comunícate with society more often than we do, although Dr. Boero indicated that media filtres the knowledge we are able to convey to society highlighting those ideas than are impacting and can be conveied quicly (seconds). The notion that external drivers of change may be identified was, however, challenged by Drs. Silvert and Gili, as intrinsic changes may occur due to desease, natural periodicity of systems, chaotic population dynamics, which may lead to extinctions, and the ability of systems to respond to noise at frequencies close to a resonant frequency of the system. what is the value of change of Marine Biodiversity? what can we do to know the presently unknown? what are the consequences and costs of not knowing? Changes in Mediterranean and Black Sea Biodiversity were further documented by Drs Jakov Dul?i? and Lovrenc Lipej, who stated that new taxa of marine flora and fauna are still being recorded each year in the Adriatic, a relatively well-studied area, including numerous new first records, as a result of recently adopted techniques, such as visual census observations. They also reported seven Lessepsian migrants. The contributors attributed this increase in number of species to climatic and oceanographic changes and to a lesser extent to biological invasion. In the Black Sea, the status of the nematode fauna was summarised by Irina Kulakova, who concluded that long-term observations are essential for the evaluation of any change in nematode fauna in the Black Sea. Yuvenaly Zaitsev gave further evidence for Biodiversity changes in both plankton (development of dinoflagellates at the expense of diatoms) and benthic (loss of Cystoseira and Phyllophora biocoenoses) communities of the Gulf of Odessa, caused by human activities. He reported that the low diversity Black Sea is characterized by low "biological immunity", which has instrumental consequences for the naturalization of many exotic species (practically unlimited growth of their populations, in the absence of antagonistic species, which may have important consequences for the native species), the development of which may severely impact fisheries. - Ferdinando Boero answered the first question by wondering what is the meaning of value? is it the gain that we can get from it? or is it the loss? He proposed the case of Lessepsian migrants as a good example to start evaluating changes in Marine Biodiversity: the inflow of species can be judged as positive, since an ecological semi-vacuum began to be filled, increasing diversity and also economic yields. Roberto Danovaro proposed two alternatives in order to find ways to evaluate Marine Biodiversity: 1) to start thinking of how much we can profit from the existence of a species or of an habitat or landscape in case we do have the relevant information (otherwise we should do more research; 2) to start making the "classical" market investigation by creating adequate questionnaires. He predicted that the results could be interesting within a twofold benefit: they would enable us to better understand what is the public perception for marine ecosystem conservation, and also to understand how little success we have had so far in educating public. - Ferdinando Boero also tackled the second question by proposing a three-level procedure: a) to identify community types, and related habitats, and map them; b) to try to answer the question: How many species are there in the region? c) to try to answer specific questions at the genetic-level, concerning the viability of populations and the distribution limits of the alien species. - The third question was also tackled by Ferdinando Boero. He started by stating that we cannot answer this question because we simply do not know. He attributed this inconvenient situation to the fact that we usually start studying phenomena when the causal agents do not occur any longer. He added that we usually only focus on regularities, while the important thing is the point at which the system changes. He further argued that the cost of not being able to explain means that costs are caused by the fact that management is based on ignorance. Finally, he proposed that biodiversity research, at all levels, has greater priority than economic evaluation, as long as the governments provide money to explore extraterrestrial life. This last point was further tackled by William Silvert, who made a cogent point that it is a risky business saying that we don't know enough, when scientists meet politicians and managers. He proposed that we have to accept that the amount by which our ability to make good predictions grows is a decreasing function of how much we know, and we can reach a point where no matter how much more we learn, we will not be able to describe the functioning of the system any better. He also questioned the utility of the world's undescribed species (perhaps the majority) as a major impediment to our ability to make sound recommendations on the management of marine ecosystems. Ferdinando Boero responded by stating that unless we have reliable data at hand we cannot convince the politicians of the need for Biodiversity research. He also added an example of the cost of not knowing, based on the absence of Posidonia meadows along the Adriatic coast of Italy, a situation which leads to coastal erosion. Similarly, we should know the rate of erosion of white coral communities or of coralligenous formations. Dr. Lydia Ignatiades stated that the sequences and losses of not knowing the importance of biodiversity might have dramatic effects on the marine ecosysten and therefore, on the future well-being of humanity. At this stage the discussion was re-directed by the message delivered by Dr. Martin Sharman (Bioplatform). He stated that we must address the root causes of loss; we must change many human values, attitudes and behaviours that tend to reduce biodiversity and hence are not sustainable at present population levels. He added that we often talk of poverty as a root cause, but that growth in a limited system is probably more dangerous. He asked whether it is possible to use the collective knowledge of our world civilization to cause our society, our politicians and our multi-national corporations to embrace sustainability, rather than growth, as a goal? Dr. Allan Watt suggested that we must change many human values, attitudes and behaviours that tend to reduce biodiversity, in order to address the root causes of loss. Accordingly, we first need more knowledge, particularly on the root causes of loss (the drivers and pressures that determine biodiversity) and on human values, attitudes and behaviours. Additionally, we need to acquire this knowledge in such a way as it is most meaningful and most readily applied to address the loss of biodiversity in Europe. He concluded that research on the drivers and pressures of biodiversity should be integrated with the core monitoring programme to create much more than a network - a biodiversity monitoring and research observatory system. At this point, Angheluta Vadineanu proposed that Biodiversity is the foundation and the source of a wide range of natural resources and services as well as the interface with socio-economic systems within the socio-ecological complexes. Provided that the environment has a "hierarchical spatio-temporal organization" she focused on the needs for complementary methods and procedures for economic valuation of natural resources and services. She stressed, however, that the success of such a development depends on reliable and complete data, information and knowledge from all levels of biodiversity. It could be argued that this session has concluded by demonstrating a clear need for an umbrella Project, which would serve both networking and monitoring activities, as well as offering a viable interface with socio-economic systems. Martin Sharman introduced the issue by posing the central question which is: how does science contribute to governance in day-to-day exchanges, given that policy-makers work on a different time scale from scientists. He argued that policy-makers are usually forced in to making "quick and dirty" partial solutions, perhaps based only on very shaky scientific observations. Biodiversity scientists, on the other hand, typically work to the rhythm of multi-annual funding and project cycles, as they track hugely complex phenomena whose changes may sometimes be confirmed only after many years - and perhaps even decades have elapsed. Finally, he poses the dilemma of scientists who are being asked for advice by managers: should they respond by providing the "best practice" scenario associated with doubts, guesses and schedule of work for a better-substantiated answer, or should they simply reply that they cannot provide advice in the absence of data? Consultancy by adhoc groups of scientists working in the field was proposed by Josef Settele as one of the potential approaches that would improve the "best practice" scenario. Working in close collaboration and sharing responsibility jointly by scientists and politicians was proposed as another approach to improve the above scenario, by Katalin Torok. Ian Davies, instead, argued that scientists should, first of all, be honest. Lydia Ignatiades also supported this view, later, by bringing up the example of doctors fighting against cancer: they still tell the truth. Ian Davies proposed that a better route to a scientific programme that will ultimately benefit society is to indicate to the policymaker that the scientist can see ways forward, and to offer to meet and discuss to agree the general direction of a subsequent proposal. Rainer Muessner added that if we speak of "good" governance, this tendency should be counter-balanced by some long-term, strategic decision making, that opens visions in policy and maybe in biodiversity too. In such situations the time horizons of politicians can be even longer that those of scientists. He observed that scientists have very seldom the chance to influence policy and stressed that in the case that they have no advice to offer to the politicians, they run the risk of getting "out of the game". However, he thought that the "best practice manuals" do not suit such occasions well. William Silvert offered simple examples put forward by the fuzzy logic control theory, in order to show that "best practice" manuals might not be effective. Alan Feest proposed a way forward for facilitating information collection by scientists advising policy makers, accompanied by a well-defined set of questions. At this stage Christos Arvanitidis and Anastasios Eleftheriou gave some of the fundamental differences between Terrestrial and Marine Biodiversity and suggested two changes at the European Union policy-level: 1) to replace the "primitive" way of burning oil for energy production by other technologically more advanced solutions (e.g. hydrogen reactors); 2) to replace the "aggressive" anthropocentric economic attitude by a "peaceful" environmentally benign economy. These changes were sustained by Lydia Ignatiades, later in the discussion, who also proposed them as long-term actions and suggested intensification of scientific effort along with other appropriate actions of biodiversity conservation. Ferdinando Boero further commented on the observed differences between Terrestrial and Marine Biodiversity. The only message directed to this Session from the Marine Biodiversity section was delivered by Nina Shurova. In this message the severe changes in age structure, growth, production, mortality, average age and life span, as well as incidents of mass mortality of the commercially exploited species Mytilus galloprovincialis, are described. The contributor concludes that the exploitation of 9,360,000 tonnes reported from the Ukrainian coasts in the 60s has now practically ceased. A. Presentation of the e-Conference The e-Conference took place out from 7th to 20th April. The Conference was moderated by the Institute of Marine Biology of Crete (IMBC), Greece, and was hosted by the Flanders Marine Institute (VLIZ), in Belgium. During the first week, sessions were exclusively focused on Marine Biodiversity issues, while during the second week sessions were running jointly with those of Bioplatform e-Conference. Five MARBENA sessions were introduced and chaired during the first week, while only one, took place during the second week. The remaining 3 sessions were introduced and chaired by Bioplatform. An additional session was created in order to allow people to deliver messages on issues, which were not included in the MARBENA e-Conference. Seventy-one participants from 16 Countries delivered 226 messages, in total. Participants were not only from Mediterranean Countries but also from other European ones, as well as from the USA. 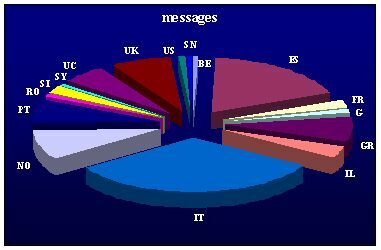 The distribution of messages to Countries is shown in Figure 1. Most messages were delivered by authors from Italy, Spain, Norway and the UK. Figure 1. Pie chart, showing quantitatively the participation of each Country to the e-Conference. IT: Italy; NO: Norway; PT: Portugal; RO: Romania; SI: Slovenia; SY: Syria; UC: Ukraine; SN: Sweden; BE: Belgium; ES: Spain; FR: France; G: Germany; GR: Greece; IL: Israel. However, the vast majority of messages have originated from Mediterranean participants, a fact indicating that people around the region are aware of the Biodiversity issues which they want to communicate to the broader scientific audience. The distribution of the messages to the sessions of the Conference is given in Figure 2. Most messages delivered during the first week were focused primarily on sessions 1, 3, 4, and 5, while a substantial number of messages were delivered in a special session created over the duration of the Conference in order to initiate general discussion and synthesis issues. Figure 2. Distribution of messages to the various sessions of the e-Conference. In the following sections, the concluding remarks of each session are presented. 1. The Mediterranean and Black Sea appear to be the richest, in terms of species diversity, European region. This high diversity richness is attributed primarily to the eventful geological history and to the large variety of habitats present in the region. 2. Changes in Marine Biodiversity of the region have been documented in many parts of the Mediterranean and are attributable both to natural phenomena, global change and anthropogenic activities. 3. Research has shown that changes in Biodiversity may well affect the ecosystem functioning, even in the case of invasions by a single species, with important consequences both to nature and society. 4. Mediterranean and Black Seas provide a unique opportunity to launch large Research Projects, targeted to patterns and processes, which affect the entire biosphere. C. Session 2: Historical and contemporary perspectives concerning species composition, their distribution and general trends of their abundance over time. Fish and commercially exploited invertebrates, chaired by Francesco Sarda. 1. Mediterranean fisheries are characterised by high diversity in terms of catch composition and the structure of the fisheries sector. 2. Lack of reliability of time series data seems to be a major impediment when results on natural variability of populations are required. Some data, however, can yield valuable information on the ecology of the target species. 3. Invasive species can easily be established populations in the region being facilitated by fisheries activities, which tend to be fishing-down-the-food-web thus leaving more space for the invading species. 4. It is widely accepted that only under an Ecosystem-based Fisheries Management (EBFM) both conservation and management priorities will achieve a high level of integration. D. Session 3: Historical and contemporary perspectives concerning species composition, their distribution and general trends of their abundance over time. Identification of "hot spots" of species/habitat diversity and productivity, chaired by John Gray. 1. Although the idea of the hot-spot areas provides a good framework to set priorities for marine biodiversity, nevertheless, it is very difficult to define marine hot-spots. The major impediments which were mentioned that a substantial scientific effort on basic biological, ecological and evolutionary studies are lacking and that our estimates of species richness are still far from being considered as reliable. Additionally, when we attempt to estimate species richness, we often neglect the historic (evolutionary) aspects. 2. No scientific data exist so far to support or reject the diversity-productivity model, in the region. 3. The concept of conservation key species, which play an important role to the ecosystem may still provide a tool in conservation of marine biodiversity. Although habitat conservation may assist biodiversity conservation, ecological and evolutionary processes must be taken into account. E. Session 4: Identification of the critical information gaps - Information gaps for important fish and invertebrates resources and impact of introduced and/or immigrant species; information gaps on species/area relationships in the Mediterranean and the Black Sea; information gaps concerning important habitats in different geographic regions, chaired by Roberto Danovaro. 1. Although considered as one of the best-studied seas of the world, there are still major gaps to be covered in the field of Biodiversity of the Mediterranean and Black Sea. This means that scientists are not able to translate their scientific information into precise conclusions and guidelines to support adequate political decisions. 2. We still need more information on variability of biodiversity at different scales (from local and meso-scale, to seascape scale). We also need to test hypotheses at these scales such as whether the local species pools are random samples from the regional species pools. 3. There is still limited knowledge on the role of physical processes in the development and maintenance of biodiversity. The identification of suitable locations for the study of the physical processes that control marine biodiversity, such as the straits of Messina, constitutes a major gap to this end. 4. Cross-nation effort to establish baseline information for assessing historical trends in marine biodiversity, is also needed. Archaeology would be a model approach to study the long-term biodiversity trends. 5. The effects of anthropogenic impacts (eutrophication, environmental stressors and micro pollutants) on both structural and functional aspects of biodiversity are of particular interest for the Mediterranean Sea. This is because the Mediterranean is subjected to a high degree of human activities, leading to an ever increasingly large coastal expansion in development. We need accurate methods and tools to detect these changes at the regional, coastal and national scales. The potential of recently developed research fields in the marine science, such as microbial-molecular parameters and the trophic breath should be tested. The development of indices integrating both ecological and social values are urgently needed. 6. A huge gap still exists in the coupling of classical and molecular techniques in the study of biodiversity. Classical taxonomy could benefit from the recently developed molecular and genetic techniques, which would allow for testing hypotheses already in place. For instance, extracellular DNA may potentially represent a reservoir of genes contributing to misleading the actual diversity of prokaryotes. F. Session 5: The unknowable - Identification of the drivers of change - Potential drivers of change to marine resources in the Mediterranean and Black Sea; prediction and mitigation schemes, chaired by Carlos Duarte. 1. Major changes in marine biodiversity in the Mediterranean following large changes in sea level over geological time scales, as well as chatastrophic perturbations, have been documented. 2. Human pressure has been identified as a new, growing driver of biodiversity change in the Mediterranean and Black Seas in the past two millenia. 3. The potential of amplification of the impacts of climate change on marine biodiversity in the semi-closed Mediterranean and Black Seas, and the likely earlier changes in biodiversity in comparison with other Seas, should be studied. 4. Scientists have to spend more time and effort in order to communicate major issues to society, at large. G. Session 6: Does marine biodiversity really matter? How could change represent value in Marine Biodiversity; what can we do to find out more about what is unknown, at present; what might be the consequences and the costs of not knowing chaired by Anastasios Eleftheriou. 1. What is the value of change in Marine Biodiversity? A two-level approach has been proposed in order to answer this question: i) to start thinking of how much we can profit from the existence of a species or of a habitat or landscape in case we do have the relevant information (otherwise we should do more research; ii) to start making the "classical" market investigation by creating adequate questionnaires. It was also proposed that the case of Lessepsian migrants might be a good example to start evaluating changes in Marine Biodiversity: the inflow of species can be judged as positive, since an ecological semi-vacuum began to be filled, increasing diversity and also economic yields. 2. What can we do in order to know the presently unknown? This can be a three-level procedure: a) to identify and map community types, and related habitats; b) to try to answer the question: how many species are there in the region? c) to try to answer specific questions at the genetic-level, concerning the viability of populations and the distribution limits of invasive species. 3. What are the consequences and costs of not knowing? It was argued that the cost of not being able to explain means there are economic consequences caused by the fact that management is based on ignorance. Another issue, which emerged later on during this session, was that we should address the root causes of biodiversity loss. As growth, rather than poverty was identified as one of the root causes, it was asked whether it is possible to use the collective knowledge of our world civilization to persuade our society, our politicians and our multi-national corporations to embrace sustainability, rather than growth, as a goal? The responses included the following: i) we must change many human values, attitudes and behaviours that tend to reduce biodiversity; ii) research on the drivers and pressures of biodiversity should be integrated with the core monitoring programme to create much more than a network - a biodiversity monitoring and research observatory system; iii) provided that the environment has a "hierarchical spatio-temporal organization" there is an urgent need for complementary methods and procedures for economic valuation of natural resources and services. I. Session 7: Science for better governance (joint session with Bioplatform). The discussion was initialised by the central question: how does science contribute to governance in day-to-day exchanges, given that policy-makers work on a different time scale from scientists. It was argued that policy-makers are usually forced in to making "quick and dirty" partial solutions, perhaps based only on very shaky scientific observations. Biodiversity scientists, on the other hand, typically work to the rhythm of multi-annual funding and project cycles. The dilemma of scientists who are being asked for advice by managers, was finally asked: should they respond by providing the "best practice" scenario associated with doubts, guesses and schedule of work for a better-substantiated answer, or should they simply reply that they cannot provide advice in the absence of data? Consultancy by adhoc groups of scientists working in the field was proposed as one of the potential approaches that would improve the "best practice" scenario. Working in close collaboration and sharing responsibility jointly by scientists and politicians was proposed as another approach to improve the above scenario. A few scientists argued that scientists should, first of all, be honest. Others said that if we are to speak of "good" governance, this tendency should be counter-balanced by some long-term, strategic decision making, that opens visions in policy and maybe in biodiversity too. It was also put forward that "best practice" manuals might not be effective. Changes in the European Union policy-level, such as: a) to replace the "primitive" way of burning oil for energy production by other technologically more advanced solutions (e.g. hydrogen reactors); b) to replace the "aggressive" anthropocentric economic attitude by a "peaceful" environmentally benign economy, were also suggested. J. Session 8: Biotic resources: from exploitation to innovation and local development (joint session with Bioplatform). The only message delivered to this Session from the Marine Biodiversity section documented important changes in age structure, growth, production, mortality, average age and life span, as well as incidents of mass mortality of the commercially exploited species Mytilus galloprovincialis, which have lead to the cessation of the exploitation activities, within the last forty years. K. General discussion - Synthesis: special session for the MARBENA e-Conference. 1. Additional information given for the Mediterranean Marine Biodiversity, concerning the areas where a relatively low degree of scientific effort has been spent. 2. Recently developed disciplines in Marine Biodiversity, such as the relation between Biodiversity and Ecosystem Functioning, through the development of a new generation of scientists skilled in various methods and techniques. 5. A much faster response of the Mediterranean biota to climatic change has been observed. 6. The Mediterranean constitutes a natural laboratory where many aspects of biodiversity can be observed and tested.